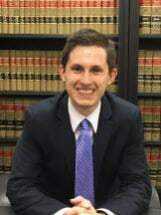 Andrew Ferencevych is admitted to the New Jersey State and Federal Bar and the New York Bar. Since joining the firm, he has appeared in both New Jersey state and federal courts, as well as municipal courts throughout the State. Mr. Ferencevych has worked on complex state cases in criminal law. He has tried criminal cases before a jury, non-jury civil cases, and domestic violence matters. Mr. Ferencevych has sat second chair in homicide trials, and has handled cases in the Superior Court and the Appellate Division that have resulted in the reversal of convictions, suppression of evidence, dismissals of indictments, and termination of Megan’s Law (RCNL) registration requirements. Prior to joining the firm, Mr. Ferencevych clerked for the Honorable Edward M. Neafsey, J.S.C. in the Mercer County Superior Court, Law Division, Criminal Part.